March 4-15 was the annual Middle School Reading Appreciation Program (RAP). During these two weeks, MS students and teachers engaged in various activities designed to build appreciation for and enjoyment of reading. During the first week of the event, the middle school enjoyed daily poetry readings during class. Also, on three different days, students were invited to attend book talks hosted by the YISS Secondary Media Center during homeroom. Staff shared about good books they had read and recommended to middle school students. Additionally, students participated in Drop Everything and Read (DEAR). DEAR times were not announced ahead of time, so students were challenged to have a book with them at all times to read. When the announcement was made for DEAR, the entire MS dropped everything and read for 10 minutes. Daily raffle prizes were drawn from the names of those students who were prepared and ready with a book for DEAR time each day. This year, the Read-In, which took place on Friday, March 8, was introduced. Students were invited to come after school and curl up with a good book. The event began with students first sharing the book they planned to read and why they had chosen that book. Later, students shared about what they had read. They enjoyed hearing about their friends’ books and making predictions about what would happen next. A favorite event among students was The Mystery Reader. During the second week of the program, each day began with a teacher reading an excerpt from a book. Students listened to the excerpt, and then they had the chance to guess which teacher or staff member was reading and which book they were reading from. The first to guess correctly won a prize. The 8th grade WEB Leaders added a special twist to RAP by showing up to read books to 6th grade homerooms. The 6th graders enjoyed the surprise and the cake that the 8th graders had brought with them. The highlight of MS RAP for many was Yangsook Choi’s visit. On Tuesday, March 12, Mrs. Choi shared with the entire middle school student body about her journey to becoming an author and illustrator. She also shared about the graphic novel she is currently writing. Students were invited by Mrs. Choi to ask questions, and they took great advantage. They asked her to share some additional information about her experience in art school, getting her work published, and her family. They also asked for advice about overcoming writer’s block and getting good story ideas. 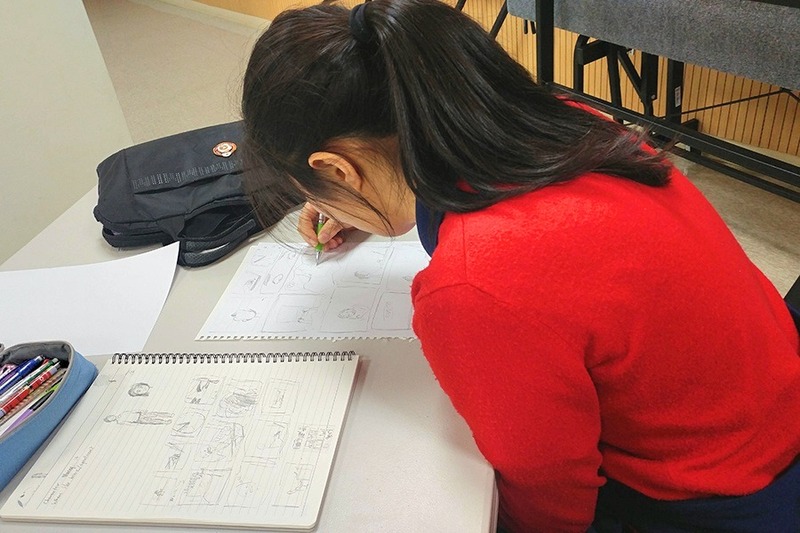 She also conducted two workshops for middle school students about writing a graphic novel. 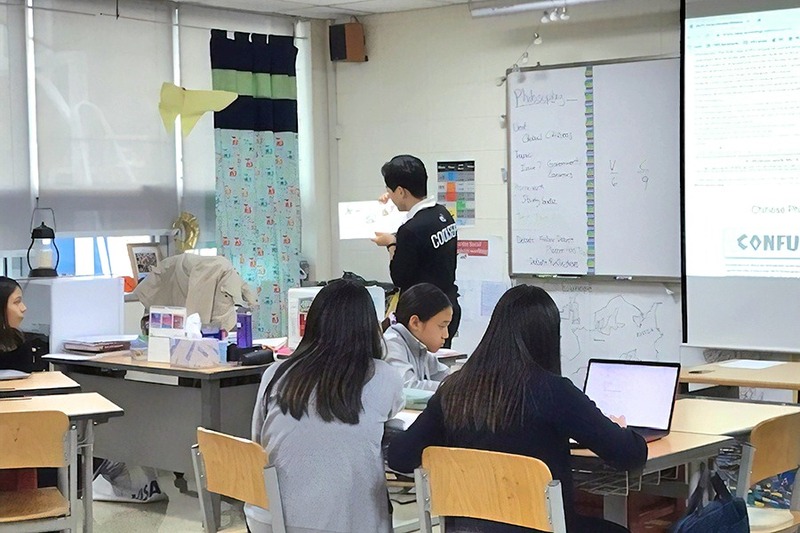 More than 40 middle school students participated in these workshops and had a chance to try developing their own stories into graphic novels. We are thankful to our supportive PTO who supplied plenty of snacks for Book Talks and the Read-In, and prizes (such as books, gift certificates to the upcoming book fair, and Starbucks) for book talk raffles, DEAR raffles, and Mystery Reader winners.